Depend on Country. Condition :good. u.s.a 2-3 weeks. 50/50 cotton/Polyester made in usa. Original vintage Hawaii 1980 two-tone jersey number t-shirt. Soft 75% cotton- 25% poly tee by Hanes. White base with golden yellow ringer neck and short sleeves. Hawaii 80 screen printed in navy blue and gold on front. Designs Tees Hawaii, Inc. graphic. Vintage condition with general signs of use. Front graphic shows some minor fading. Marked vintage size x-large and now fits closer to a snug large. See full item description for complete details and measurements. Don't expected the item to be like new. There are minor signs of worn. No obvious holes or stains spotted. Very light and small one or two flaw spotted at the bottom of the t shirt. No crackered on the print. Vintage 80s Kliban Cats Hawaii computer mouse t-shirt. Soft 100% cotton by Crazy Shirts Hawaii, made in USA. Great condition. No holes, no stains, no issues. Size L. Please note measurements to avoid returns: laid flat measures 20.25” across chest (armpit to armpit), 27.25” length (top of collar to bottom of shirt). 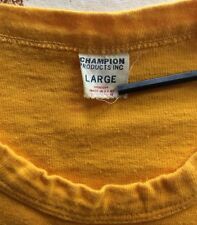 Vintage 60s Champion Products jersey-style t-shirt. Feels like 100% cotton, made in USA. Several holes near the bottom on the right side, a few small black marks, as shown in the photos. No underarm stains, no other issues. Tag size L, but fits much narrower than today’s L, more like a long S. Please note measurements to avoid returns: laid flat measures 17.75” across chest (armpit to armpit), 27.5” length (top of collar to bottom of shirt). Vintage 1975 Po Folks Restaurant t-shirt. Soft, light 50/50 cotton polyester by BB, made in USA. Several faint blue stains on front left side near the collar and sleeve, as shown in the photos. No holes, no underarm stains. Tag size M, but fits smaller than today’s M, more like an XS. Please note measurements to avoid returns: laid flat measures 17” across chest (armpit to armpit), 23.25” length (top of collar to bottom of shirt). Size Large (42-44). Does have dot stains on the back. About 8 and like 2 on the front. Showed next to pen to see the size of the dots. Chest, pit to pit: 19.5". Preowned condition with light fading and peeling. Distressed and faded with general wear/marks throughout as seen in the photos. This item has been laundered and is ready to wear. Chest- 18". Length- 24.5". 7 5 " p i t t o p i t.
All unused iron-ons are being sold as collectibles. The iron-ons are much more colorful and vibrant once they have been properly applied if they still are usable. The below "Hulk" transfer is a successful example. An inner pocket muslin has a water mark. Pleated front. Check out all of the photos. Waist: 9” (w/o stretching). -Waist to Ankle: 43.5". Colors may be slightly different due to monitor settings . shoulder to shoulder 15. good shape: has a couple flaws seen in pics. Made in Japan. In very good condition. Length: 21”. Mickey Mouse Sweater. 5 Panel Hat Color Block Mickey. Color Block. Preowned vtg men’s 1960s 70s Bonner Mfg brand bright yellow cotton zip-up rockabilly windbreaker auto parts race jacket made in USA. Classic retro old school gear head greaser car club hot rod drag racing lightweight shell coat featuring Davis patches and black chainstitch embroidered “Pete” XPC Performance Parts and piping. Light wear, good condition, see pics. Sz medium. Pit-pit 24”. Collar seam down back to bottom edge 22.5”. Back across shoulders 17”. Sleeve 22”. Please compare measurements with an item that fits well. No returns. Measurements estimated to best of our abilities. Sold “as is”. Write with questions. Free shipping USA. 20% restocking charge on returns. HILFIGER PRINTED ON FRONT CHEST. HILFIGER LOGO ON SIDE TAB. CLASSIC TOMMY YELLOW LOOK. TWO FRONT CHEST POCKETS. This is a tee from the 70's. This is an original item and not a reprint or facsimile. This is the type of shirt that would have been used by wardrobe for the Fight Club movie. made by L&H in the 70’s. Made in USA. Size small. Still sealed in wrapper. Vintage Boston Marathon t shirt, size small 100% cotton Two small holes and dislocation marks on front lower left. One small hole on back lower left. In otherwise great vintage condition. Incredible design and fade! Underarm to Underarm: 23". Top of Shoulder to Bottom Hem: 24". Item will be tightly folded. There are more large photos of this item at the bottom of the page. Never worn or washed. Super soft and thin 100% cotton by Hanes. shoulder to bottom: 26.5". This features fully embroidered letters and motorcycle. The jacket is a windbreaker type with full cotton lining, and dark mustard color. Mc, and Wheelettes on the back. Jacket length (From bottom of rear collar). Good condition. This is why is says "C.J." on the front of the jacket. Faded with general wear/marks throughout as seen in the photos. This item has been laundered and is ready to wear. Length- 26.5". This sale includes the 3 pair of socks in the pictures. New with tags. Several storage discoloration spots (see pictures). The Orlon is very thick and soft. No odor ready to wear. The total length is about 20 inches long. PLEASE SEE THE PICTURES AND PLEASE ASK ANY QUESTIONS BEFORE BIDDING ON THE Lot. Add me to your Favorites Seller's List S2 E LINING (Full or Partial): F Measurements Chest: (Across chest armpit to armpit, doubled): 48" Overall Length:27" Sleeves (From center of collar to outer cuff of sleeve): 35"
Dated 1982. Anvil, 50% Kodel polyester, 50% cotton. In used condition. Shirt is thin, stretchy and soft, and shows light overall pilling. Slight fading under arms and a few small brownish stains on front. Original 1983 Thought Police Shirt. No Back Graphics. Shirt is in good condition, no holes, small mark on front.